Since ancient time, Noodles had been a long and staple food (beside rice) in many Asian countries, especially East and South East Asia. Due to theirs variety and implications, noodles can be found everywhere, from the local street stand to the most luxurious restaurant. There are a vast number of ways on how noodles are made, the same goes for how many types of dishes there are. 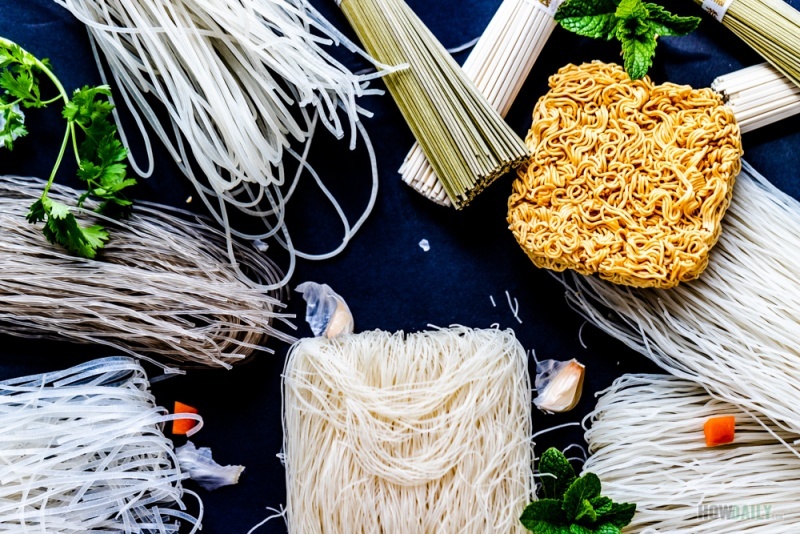 Similar to Western counterparts, Asian noodles appeared in so many styles, forms, colors with different flavors and texture. Noodles are made from some form of dough, often wheat or starchy flour with water. Lots of time, special ingredients are added to this dough to change the flavor, texture and colors appearance. To name a few: lye, egg, cereal, corn, tapioca, arrowroot, mung bean… Fruits and vegetables are also add to dye noodles color as well. Depend on the type of dough being used and its elasticity, common methods for producing noodles are: cut, extrude through pressing tubes , slice, peel, pull, knead and flick. These could be done fully manual by hands, semi with mechanical press/roller or fully automatic. 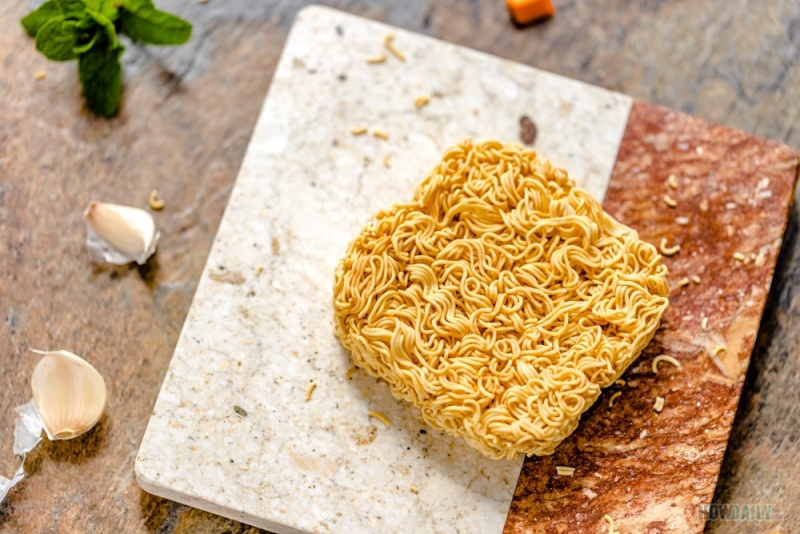 You will often find noodles in these three states: fresh, dried or fried (instant noodles), with the latter being widely available from most (if not all) grocery/convenient stores. In the US, dried noodles can usually be found on the international aisles or somewhere next to the pasta shelves of any medium to large supermarket. They can also be bought online for more convenient too. Compare to its family, fresh noodle is mainly available in oriental markets unless you live in Chinatown or an Asian neighborhood. Be ware though, since preservative-free fresh noodles have short life span (2-3 days chilled), they’re often sold same day or in freezing/vacuum sealed package. If you bought these chilled pre-packaging bags, do look at expiration date. Watch out for those that are added with borax and similar preservative agents to have longer shelves life or wash out the color. Wheat is the most common ingredient in Chinese noodles and many other Asia countries as well. 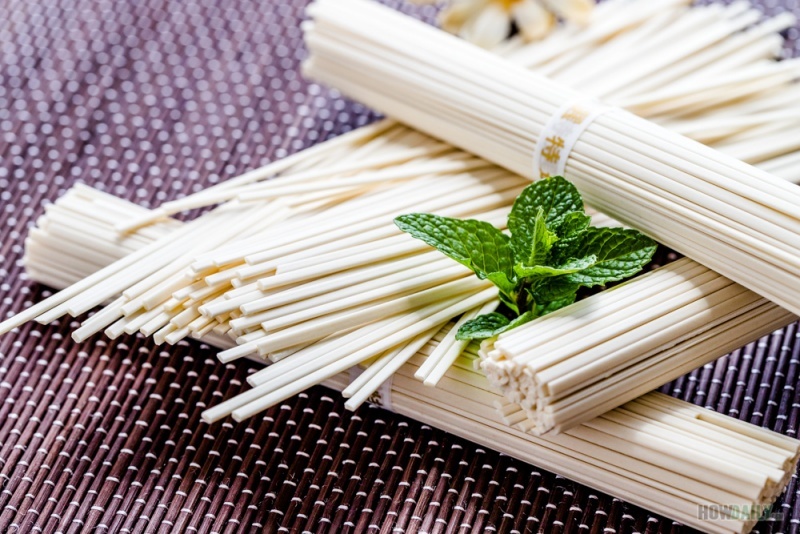 Many wheat noodles are usually made from just wheat flour, salt and water; while others have few ingredients in them like egg, lye, tapioca, arrowroot, bean, etc… to add to the flavor. Wheat noodles often appeared in long thin strip in either fresh, dried or fried (instant noodle) form. Fresh wheat noodles are coated with extra wheat flour to prevent sticking while dried noodles are not. 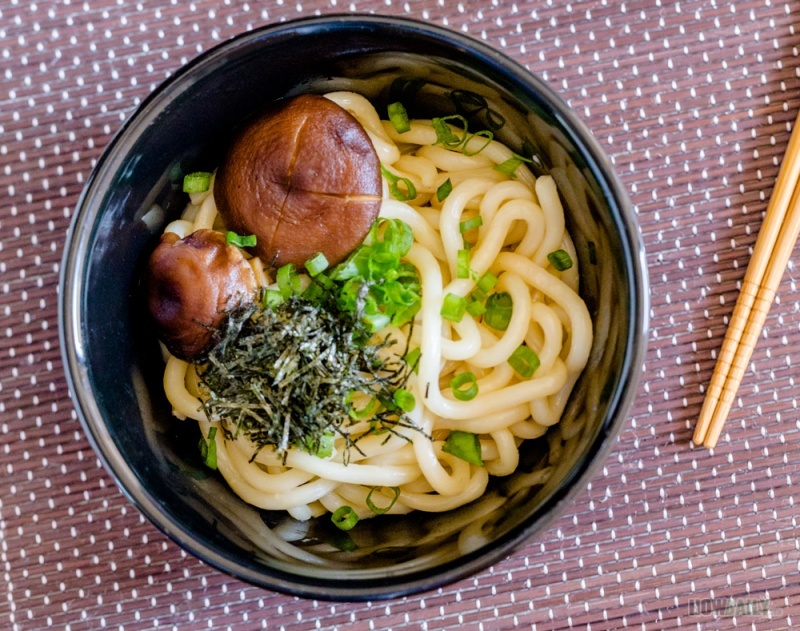 Some popular Asian wheat noodles are Udon (Japanese round thick strands), ramen (Japanese thin strands often known to the world as instant noodles), lo mein (Chinese egg noodles), reshte (pale Persian sliced noodles), etc. Wheat noodles can be boiled, baked, dip-in soup, stir fried, fried, served as wrapper (wonton, spring roll wrapper)… basically every possible methods you can imagine. Depend on the thickness, size and preservation method. cooking time might vary from 2 to 8 minutes at boiling point. Since wheat noodles tend to give off excess amount of wheat flour/powder when boiling, remember to use enough water in a large pot and stir frequently to shake them off. 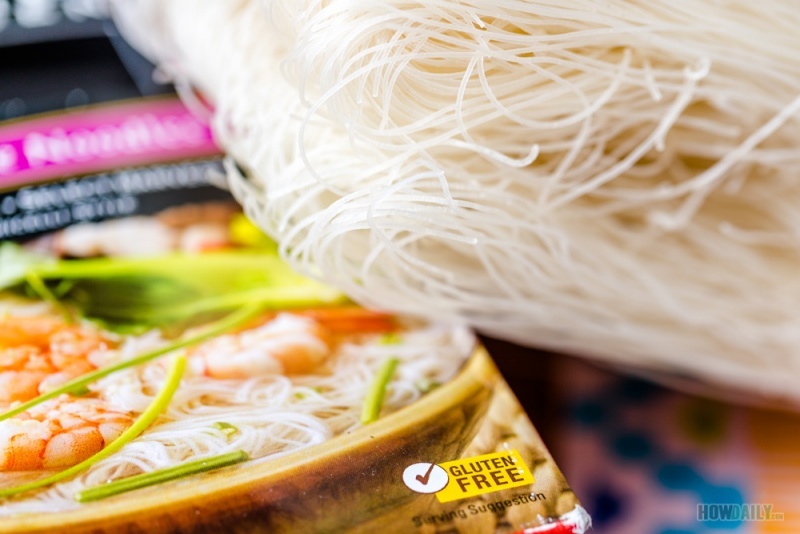 Being both wheat-free and gluten free, rice based noodles have become the trend in the West over the past couple years. Though note that both white rice and brown rice based noodles contain same amount as calorie while being less fiber and protein than wheat noodles. 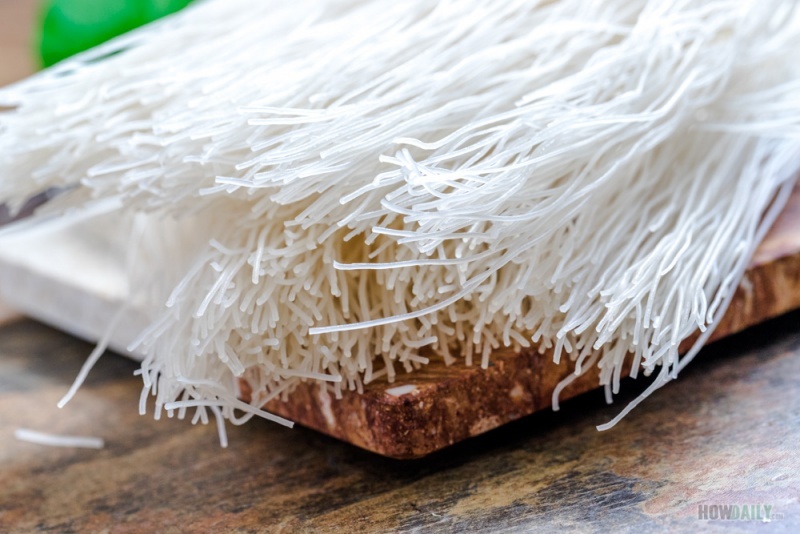 White rice noodles are often mixed by small percentage of tapioca powder, arrowroot, etc. to create the desired level of transparency and chewiness. On the plus side, most rice based noodles don’t give off excess starchy residue, so you won’t need as much water when boiling. 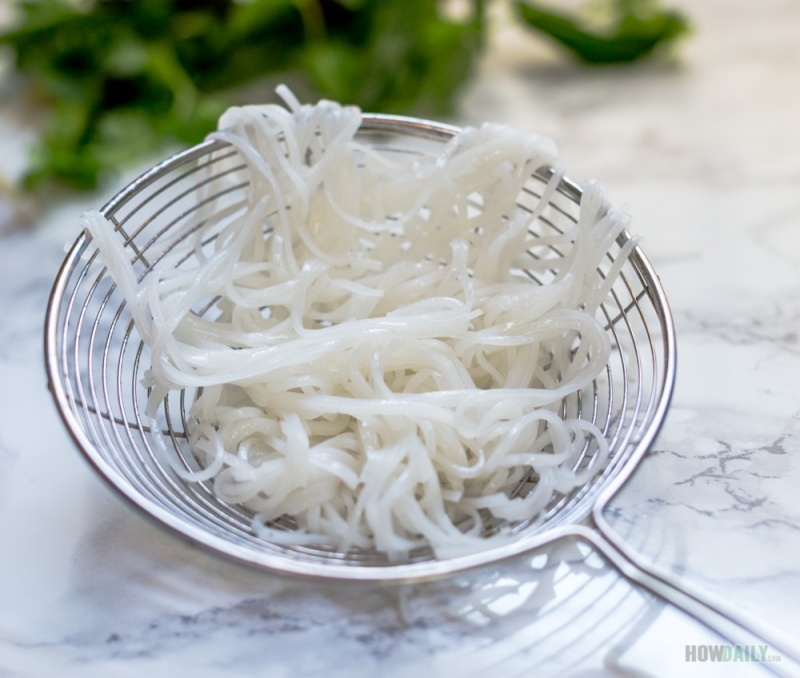 Fresh rice noodles (especially white rice based) only need quick dipping 1-2 minutes in boiling water while dried rice noodles require pre- soaking in cold water before boiling for 5-10 minutes. Nominal buckwheat noodles are from Korea like memil guksu, chilk guksu, kkolttu guksu and some Japanese soba. 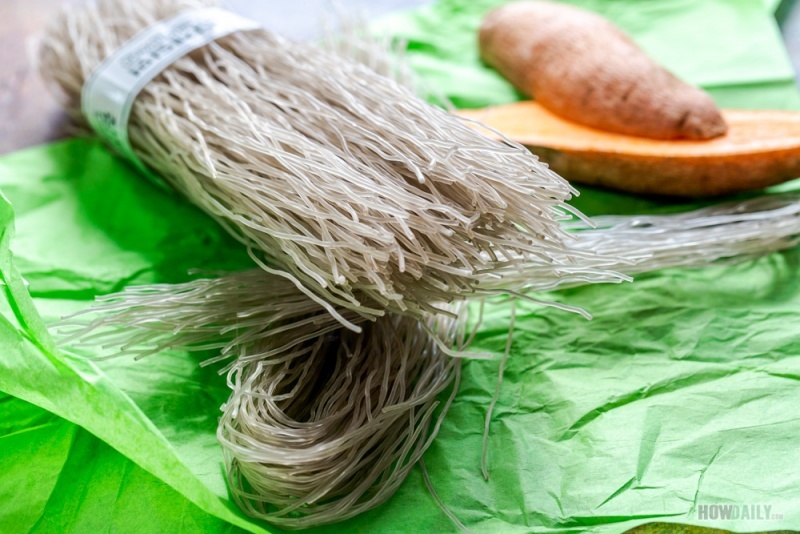 Despite the name, these noodles are made from seeds, so obviously they’re gluten-free. Note that some buckwheat noodle may also contain small percentage of wheat blended in, so read label carefully. Some soba, though using the same name, are completely wheat base and applied just like the Chinese egg noodles. Pure buckwheat noodles are high in fiber and magnesium which will help to control cholesterol, blood flow and blood sugar. Cellophane noodles, bean noodles, glass noodles… are all great example in this category. To achieve the transparent look, potato starch or tapioca is usually added together with mung bean starch. These noodles come in dried form, solid and easy to break. For soup, they can be boiled around 5 minutes before adding to the broth. Due to their elasticity and firmer texture, they often used as supplement ingredient in Asian meat stuffing and paste. If so, these are soaked before hand to soften then cut into chunks. Starch based noodles are made from starch of either sweet potatoes, potatoes, tapioca, kudzu root or corn with water. Some even results from a mixed of those. Most starch based noodles are gluten free and of course vegan, but there are few exceptions too, so read the label if this is a concern. Made without any starch or grain, kelp and jelly noodles are awarded for their super low calories, carbs while being loads with calcium and magnesium. 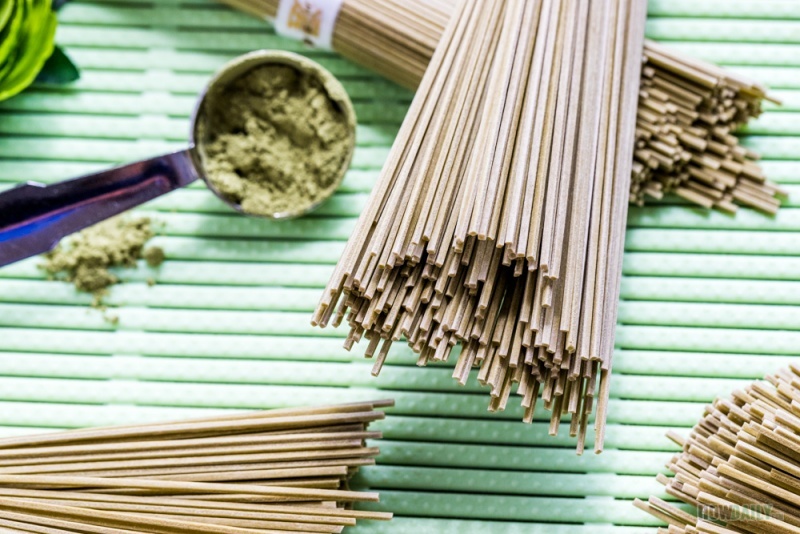 These noodles are being made from grinding powder of seaweed or kelp extract. They’re naturally glossy, semi to clear transparent in appearance and have a crunchy to chewy texture. Add with the bland flavor, these noodles often used in salad dishes or as garnishment/decoration to other dishes. You will find both kelp and jelly noodles in water-filled packages that are ready-to-eat. So no cooking is required, though you could always lightly parboil before use. These noodles can be stored for up to six months in fridge. Kelp/Jelly noodles can not be frozen or dried, so just make sure to hydrate and keep them filled with water. 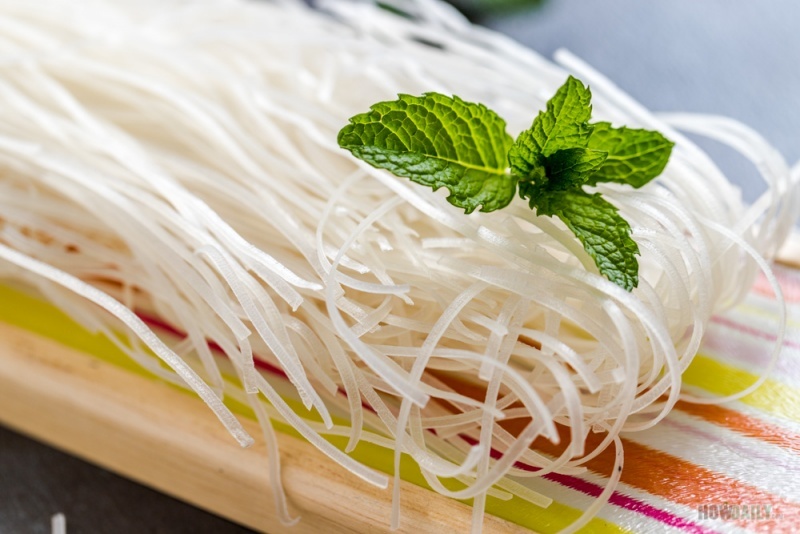 Shirataki noodles have long shelves life, often a year, in both wet (water filled) or vacuum sealed package. 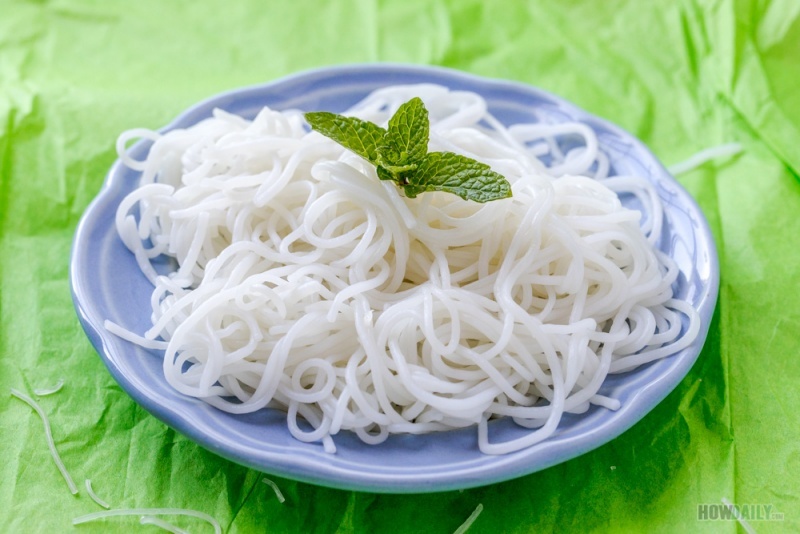 Most shirataki noodles require through out rinsing and parboiling before consuming to remove odor and bitter taste. Since shirataki noodles can be roasted, dried, soaked…they can be used in place where the regular pasta can. As you can see, any noodles that are made without egg (either duck or chicken’s) are vegan. The common places where eggs are add are in wheat based noodles, which always seem to have a yellow hue to them. So often by just looking at the colors and noodles type, you can easily tell whether it is vegan or not. Regarding gluten-free, it’s harder to tell due to all the kind of dye and flavor additives now a day. It’s also noted that some usually non-wheat based noodles such as soba, rice vermicelli, rice noodles also contain small amount of wheat, and thus existing gluten. So carefully reading the label will help if you’re keen on it. 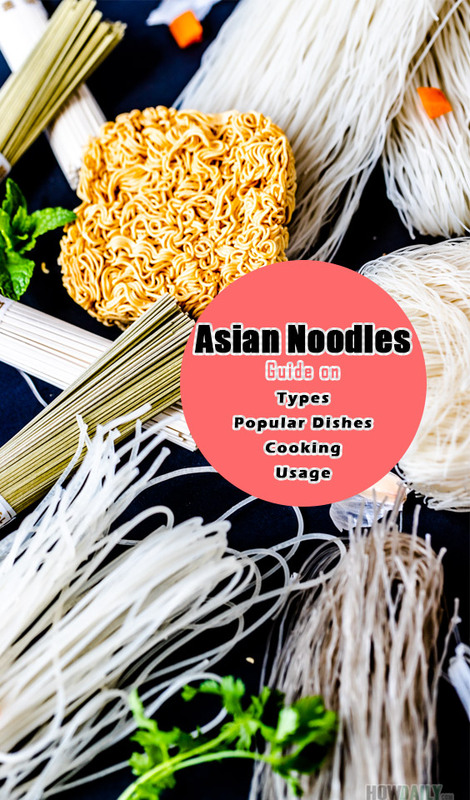 So now that you know of all the common types of Asian noodles, let’s take a look at what they are used for. These following dishes/bowls are some of the most popular Asian noodles dishes that we have tried and recommended on in no particular order. They’re all great and different in each own way, so let’s take a look, shall we. This is the bowl that I spell “home” to, hence why it is first place on this list. The bowl is a combination of any raw goodness and the most savory soup. The broth is made by stocking bone for hours on low heat with roasted onion, ginger and spices are added at the very end. 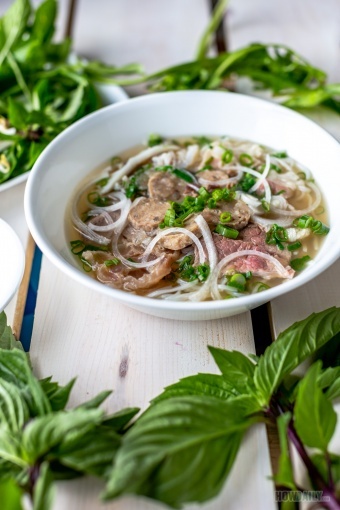 Fresh boiled rice noodle (“banh pho”), rare thin tender beef slices, chewy beef balls and all the imaginable fresh vegetable and herb, this bowl sure is one to go for when you need to recharge or replenish your body. For a start, you can try out our recipe of Vietnamese beef noodle. 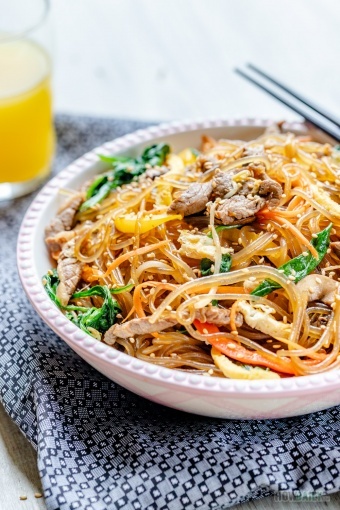 Pad Thai is a very well-known Asian dish in the State. Lots of Thai restaurant have opened over the years, and this will always be the must-have dish on the menu. What I like about this dish are the tangy-sweet combination of tamarind, palm sugar & fish sauce, the freshness of raw bean sprout and onion chive, crunch peanut over … the delicious stir fry rice noodle. I often order my pad Thai with either shrimp or tofu as topping and extra bean sprout. Those are like the best two topping combination for Pad Thai. Be ware of spicy level though, one restaurant’s hot could feel mild while the others’ medium might burnt you out. Do not mistake this for the usual instant noodle at 24/7 mart. Ramen is actually an invention of the Japanese, that made from wheat, salt water and sometimes egg. So there it goes, totally not gluten-free or vegan. The special thing about tonkotsu ramen is that the flavor feel so full of everything (umami sweet, salty, greasy… ) yet still light on the palate. In fact, that’s the case with most Japanese dishes, you don’t feel much of seasoning in them, yet they do. Ramen’s broth are brewed for hours with bones, kelp, katsuo flakes, dried sardine, shiitake mushroom and onion. The broth is so hearty and amazing that I would enjoy it more than the slice pork topping or the noodle itself. I’ve first learned of Japchae when watching the Korean drama’s Full house back in college where the protagonist was making one and it seem so easy and beautiful. So I make one myself and couldn’t be happier. This is the kind of dish that you can make with whatever available in your fridge and a pack of dangmyeon (sweet potato noodles). Typical Japchae will have mushroom, carrot, bell pepper, scallion… and a choice of protein or two. You could use beef filet, pork shoulder or fried thin fried tofu for vegan option. Ingredients are marinaded with soy sauce, garlic and co, then stir fried separately before mixing with noodles. The taste is truly good and the presentation is just so beautiful with all the vivid colors. Gluten-free, wheat-free with healthy sweet potato starch, can be vegan easily with optional topping. Popular in Malaysia, Indonesia and Singapore, there are generally three types of Laksa noodles being: curry, asam and sarawak. While curry laksa is a mixed of Indian curry and coconut cream, asam laksa has the spicy-sour taste of tom yum tamarind and light sweetness from pure fish broth. On the other hand, sarawak is the mixed of both minus the curry. The rice noodles used with laksa are the larger size strands. Toppings can be fried fish paste, fried tofu, egg, chicken shrimp, clamp … There are not much veggies to accompany this bowl beside beansprout or some decorative garnish since it already has lots of topping anyway. In the State, you probably could find wonton noodle in street stands or noodles specialty joints in China towns. Note that Wonton noodles has very strict requirements from the broth taste to the noodles texture and freshness, so any generic restaurant won’t give you a bowl as authentic and flavorful those small and often crowd ventures. Just as my gramp said, go with the shop that had the oldest crowds. There is no other dish that could give you the full essence of South Mekong delta like “Bun mam”, which literately translated to fermented fish vermicelli. To truly enjoy this bowl, you have to have a very open mind and tolerant to fishy smell, as the scent can really overpower at first. The broth is made from extracting the juice out of fermented siamese mud carp, then cook together with lemongrass, egg plant, chili pepper, shallot, tamarind to create the most distinctive flavor from any noodle soups. The toppings used a combination of shrimp, squid, snakehead fish fillet, catfish, swamp eel… Accompanied garnishment can be any local vegetable that in season such as thin slice water spinach, banana flower, water lily stems, yellow burrhead…. and other native wild veggies.